Property that is acquired during marriage is either considered marital property or community property, depending on the state in which you reside. Currently, there are nine states that enforce community property regulations: Arizona, California, Idaho, Louisiana, Nevada, New Mexico, Texas, Washington, and Wisconsin. The remaining 41 other states classify property acquired during a marriage to be marital property, meaning that when it comes to equitable distribution, property will be distributed fairly but not always equal between the parties. Community property is property that one spouse or both spouses acquire via their joint efforts while they are married, with each having a 50 percent interest respectively. All the property owned prior to the time of marriage, gifted to a spouse or inherited by a spouse is considered the property of that spouse, even throughout the marriage. This rule allows spouses to keep their property and any inheritance separate throughout the marriage from community property that spouse can fully step into the entire property if at least half of the property can be included in the gross estate. Issues can arise when it comes to commingling property during marriage. While the property is viewed as separate property if acquired prior to the marriage, if the couple commingled funds so much that it is difficult to distinguish ownership, a court may view the property as now being part of the community property and thus subject to 50 percent ownership. Marital property on the other hand belongs to the spouse that bought the property unless titled otherwise. In Texas, community property is defined the same as it has been above, with some examples being: salary/employment income, real estate or vehicles purchased during marriage, 401(k) accounts and contributions made from the date of marriage on, balance of checking and savings accounts, regardless of the status of the account. When a court is asked to divide community property, they are only required to make a just and right division, however, they will split most property 50/50 if the situation is permitting, instead of making what they think is a fair distribution, which is commonly unequal. Are You Having Problems with Property Division? 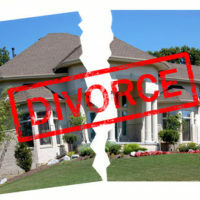 If you or someone you know is filing for divorce in Texas and is struggling to get proper division of their property, we can help you get the results you deserve. At the office of Lindamood & Robinson, P.C., our dedicated Houston family law lawyers are prepared to help you today.